Pittodrie Stadium is a football stadium located in Aberdeen, Scotland’s third most populous city with an estimated 220,420 residents. Home to Aberdeen Football Club since 1899, the 21,421 capacity stadium holds many records for stadium innovation in the United Kingdom, most notably being the first all-seater stadium. 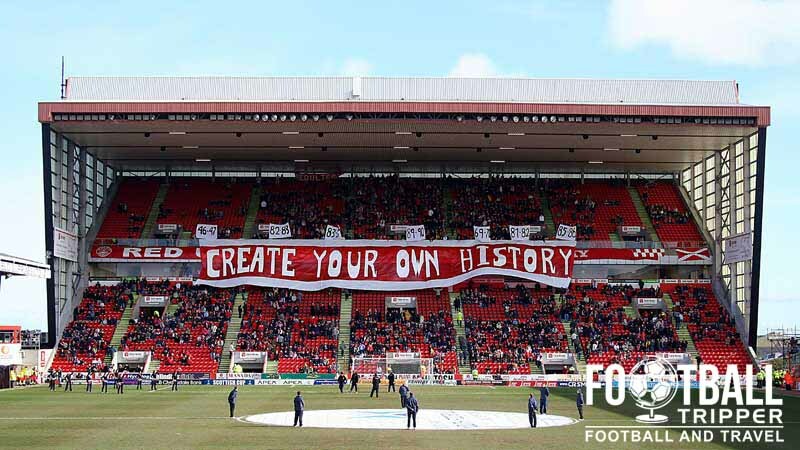 Aberdeen Football Club have played their home fixtures at Pittodrie since forming over 100 years ago in 1903, with the stadium’s usage dating back four years prior in 1899 when it was home to the original Aberdeen Club who were a precursor to today’s Dons. As a ground which dates back as early as the 19th century it’s no surprise that numerous renovations have been made over the years with Aberdeen owning the second all-seating football stadium in Great Britain. Renovated in 1978, the club followed the initiative of Glasgow Rangers who rebuilt three out of four stands at Ibrox in order to improve spectator safety after a stadium disaster killed 66 fans and injured over 200 more in 1971. Pre-dating the Taylor Report by just over 12 years, newly promoted side Clydebank converted their ground two seasons prior after being promoted with Aberdeen being wise to follow. With Sir Alex Ferguson yet to move to Old Trafford, the club were about to enjoy their greatest spell of success when the famous manager guiding The Dons to no less than three league titles, four Scottish cups, The European Super cup and League Cup all across a remarkable period of 7 years. Most famously, Ferguson defeated Bayern Munich in the quarter final of the Cup Winners Cup final in a legendary encounter at the Pittodrie – a game which is probably regarded by fans as the most magical night in the club’s history. Still riding on a financial wave after the triumphant period in the prior decade, the early 1990s saw the most recent development of the stadium take place when the club demolished the east stand and rebuilt the new Richard Donald Stand during the 1992-1993 season. Now ageing somewhat, the club have long proposed plans to move to a “New Aberdeen Stadium” which has been advised by the local council but with Scotland’s failed bid to host Euro 2008 and purse strings becoming tighter all plans are a long way off from happening. 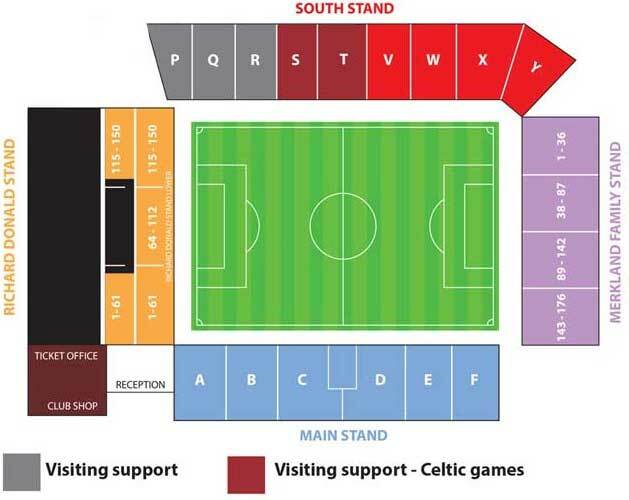 Pittodrie Stadium is comprised of four stands: North, East, South and West. 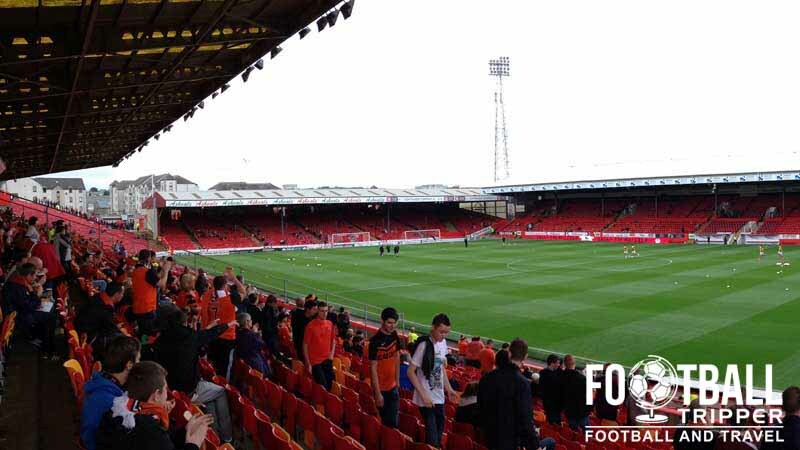 Away fans visiting the Pittodrie are usually housed within one-half of the south stand which runs for the length of the pitch, and sits opposite the newer main stand. The usual allocation of tickets is around 2,500 which takes up just over half of the stand with around 4,500 spaces theoretically available to fans should the occasion require it. The closest independently run pub to the stadium is The Bobbin on King Street which is located just behind Aberdeen Sports Village close to the Tesco Express. Describing it self as a “simple” and “lively” wood-beamed pub complete with two 2 pool tables, although the only drawback is that it isn’t the largest and it can get cramped on matchdays. Within Aberdeen City centre there are numerous watering holes you might want to drink from including Slains Castle which is a Dracula themed pub in a former Church, and The Old School house which as the name suggests is housed within an old place of learning. If you prefer something less quirky then try the The Prince of Wales Bar or The Archibald Simpson which is a Wetherspoons owned joint. The city centre is bursting full of places to eat ranging from your typical fast-food franchise such as Greggs, McDonalds, KFC and Subway, in addition to independently run restaurants such as The Prime Cuts Restaurant which served up locally sourced Angus beef steak and sea-food. En-route to the stadium there is the Bluebird Chippie on King Street which is always popular on matchdays, and failing this you can always grab something such as a pie, burger or sausage roll at the ground itself. The Dons operate a club shop at Pittodrie in addition to the online store where fans can purchase official merchandise twenty four hours, seven days a week. The modern exterior of Abeerden’s Club Shop, sponsored by Adidas. Aberdeen offer fans the chance to undertake a a fully-guided stadium tour of the facilities at Pittodrie by contacting reception either by telephone 01224 650400 or by sending an email to [email protected] Tours are available on Tuesdays, Wednesdays and Thursdays, are free of charge, and must be booked in advanced – there are no on the day tours available. 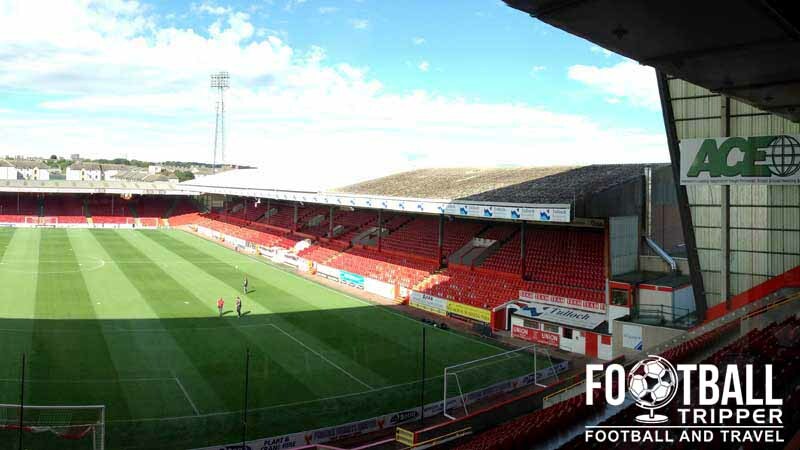 Tickets to see Aberdeen play at the Pittodrie are available to purchase via the usual channels such as the ticket office hotline (01224) 63 1903), by visiting the ticket office in the weeks leading up to the match or by visiting www.afc.co.uk/etickets, and purchasing online. Please note that the above prices only apply to tickets purchased in advanced of the matchday with admission via the turnstiles resulting in a £2.00 surcharge. Pittodrie Stadium is located approximately 1 mile from Aberdeen’s traditional city centre next to King Links Golf Club which overlooks the north sea. Parking within the immediate vicinity of Pittodrie is problematic as there are no spaces available to the general public on matchdays, and on-street parking isn’t recommended as there are various restrictions in place to protect the residential area. The Dons have launched a Park and Ride service which allows fans to easily catch a bus from the centre of town on matchdays from over three locations. The three park and ride services depart from Bridge of Don (50p), Souterhead Road – Altens (£1.00) , and Kingswells (£1.50) with each bus clearly marked with the AFC logo. Failing this, or if you are visiting the stadium on a non-matchday you can catch a bus from Union Street which will take you to Pittodrie. Number 13 (Seaton) will drop you off where the golf club is, with numbers 1 and 2 dropping you off at King Street Bus Depot which is less than five minutes from the stadium. Aberdeen railway station is located just under 1.2 miles from Aberdeen F.C’s stadium with the resulting walk likely to take no more than 20-25 minutes by foot for any fan like me with average fitness. 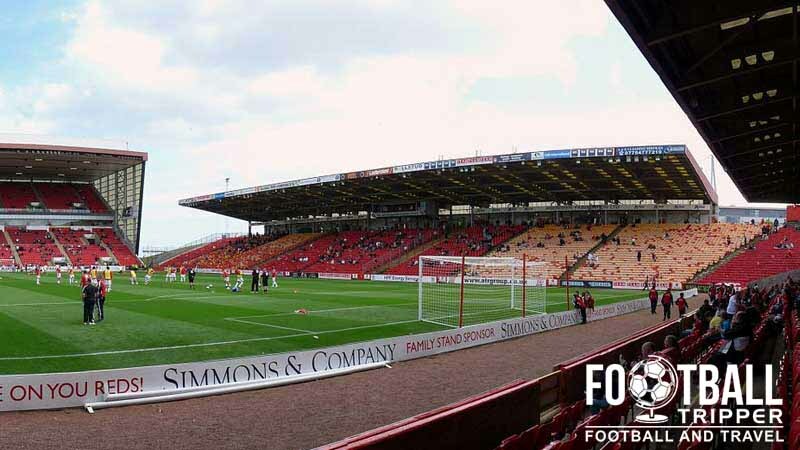 The closest place to stay to Pittodrie Stadium is the Lillian Cottage Guest House which is a small B&B with the reaming options such as The Premier Inn, Hilton Garden Inn, and The Radisson all located back towards the train station.